These beautiful ultra high relief rounds were sculpted by Heidi Wastweet, featuring the last pharaoh of Egypt, Cleopatra. The story of Cleopatra is a fascinating one filled with love interests, betrayal, murder and suicide. The obverse of this round features Cleopatra with her head turned to the side, reminiscent of ancient Egyptian art. To her left is a cartouche signifying who she is and that she is of royal descent. To her right is the Eye of Horus, a symbol of protection and royal power. Below it is a bowl of figs, representing the hiding place of the deadly sap that killed Cleopatra. The reverse of the round has the Goddess Isis in the centre, with a banner of the scarab beetle below. There are hieroglyphics as found on ancient papyrus, surrounding a pyramid. The bottom of the round has stylized carving of lotus reeds as would be found in the Nile. This round will be in production for a limited time, order yours today. In multiples of 10 this round will ship in a tube. 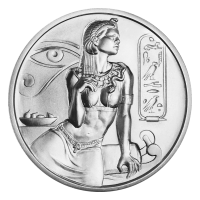 2 oz Cleopatra Ultra High Relief Silver Round These beautiful ultra high relief rounds were sculpted by Heidi Wastweet, featuring the last pharaoh of Egypt, Cleopatra. The story of Cleopatra is a fascinating one filled with love interests, betrayal, murder and suicide. The obverse of this round features Cleopatra with her head turned to the side, reminiscent of ancient Egyptian art. To her left is a cartouche signifying who she is and that she is of royal descent. To her right is the Eye of Horus, a symbol of protection and royal power. Below it is a bowl of figs, representing the hiding place of the deadly sap that killed Cleopatra. The reverse of the round has the Goddess Isis in the centre, with a banner of the scarab beetle below. There are hieroglyphics as found on ancient papyrus, surrounding a pyramid. The bottom of the round has stylized carving of lotus reeds as would be found in the Nile. This round will be in production for a limited time, order yours today.